Worm God Incarnation – Transmat Effect: Adds a vision of Xol to your transmat effects. Adaptive Frame- A well-rounded grip, reliable and sturdy. Zen Moment- Causing damage with this weapon increases its stability. Rampage Kills- with this weapon temporarily grant increased damage. Stacks 3x. It would only take one shot. That ridiculous ceremonial armor had 10 weaknesses that Bracus Zahn could spot without even looking that closely. One good shot, and everyone else would abandon this foolish crusade on this miserable planet— “This is all of them? The most advanced weapons you have?” Zahn tried not to lose his temper. “Would I have made the trip all the way to this ‘throne room’ without them?” It was a lie, of course, but this puffed-up “Dominus” didn’t need to know about the experimental vehicles Zahn had been working on since— “Were I you, Zahn, I would think hard before giving so flippant an answer.” This was the “Consul” who had deposed Zahn’s best customer. Zahn didn’t turn around as he said, “If I were you, roach, I would think hard before wasting the time of the only real weapons supplier you’ve got.” Growls from all over the room, but Zahn smiled. They needed him. And they knew it. Drop Mag- Magazine drops on reload, wasting ammunition but greatly increasing reload speed. Opening Shot- Improved accuracy and range on the opening shot of attack. Rampage- Kills with this weapon temporarily grant increased damage. Stacks 3x. 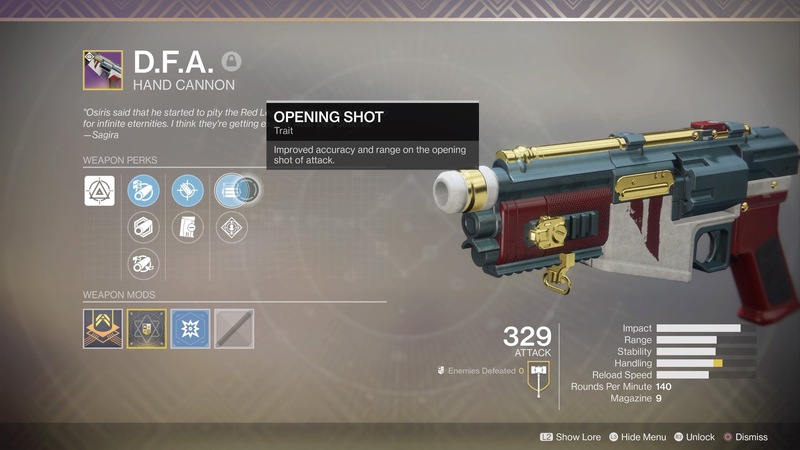 Banshee’s Favorite – Generate Gunsmith telemetry data on any elemental weapon kills at an increased rate. Nessus Experience Log – Gain 10% more XP while on Nessus. Nessus Cache Detector – Detect caches within a 30-meter range while on Nessus. Aggressive Frame- High damage, high recoil. Corkscrew Rifling- Balanced barrel. • Slightly increases range and stability • Slightly increases handling speed. Snapshot Sights- Faster time to aim down sights. A staggering Vex detonates, and the Exo Hunter is torn in two. One half sinks beneath the lake’s opaque surface. Asher’s eyes go wide and he freezes. Whatever they’d stumbled into down here was multiplicatively more lethal. He reloads his fusion rifle and looks around wildly. The other Hunter—she’s the only other one left alive, no, stay calm—throws a smoke bomb and disappears. Asher barely has time to react before the Hunter reappears on high ground and draws a bow of Void energy, almost in slow motion. Crack! Crack! Crack! Ten Vex fall. Asher watches them disintegrate, looks back up to the Hunter—but the yell of gratitude catches in his throat as four Vex shimmer into existence behind her. Asher can’t watch this time. He frantically searches for a way out… and a tentacle grabs his Ghost. A millisecond of pain in his shoulder and everything goes white. Source: Item details are from D2Wiki, Planet Destiny Database, Destiny Tracker Database, Bungie, and/or in-game.